Tomorrow, Disney will be releasing Zootopia, an animated movie that goes back to the most fundamental concept of animation: making animals talk and live like humans. Of course, to do this, those animals need cars, and Disney did this right: by hiring auto design icon J Mays to design their cars. I got to talk to him about what he did and why it’s great. Even if you don’t know J Mays’s strangely monolettered name, you’ve certainly seen or even owned his work: the original New Beetle, the Audi TT, the new Ford Mustang, the Aston Martin DB9, and more. The man’s a legend, which is what you have to be if you want to design cars for animated rhinos and shrews. I really enjoy talking with J Mays, and I’m lucky he was able to get on the phone with me and indulge all my insane questions for so long. If you’re interested in car design, anthropomorphic animals, are a furry, or all three, I think it’s worth the read. Me: I don’t know if you remember, but we did talk before. In LA, a while back. I was the guy who had a sharpie and a big pad, and was drawing while we talked. J Mays: Oh, of course I remember you, yes! I can see that interview pop up occasionally, and I always think, my god, I was very hung over in that interview. Me: No one noticed in the comments, though. You’re in luck. J Mays: Yeah. Very funny, though. Me: I’m glad! This looks like a lot of fun what you’re doing here. Tell me — what did Disney ask you to do here? J Mays: Well, this kind of goes back to 2005, to give you the 60 second backstory: When John Lasseter was head creative at Pixar, I got to know him when they came to Detroit, and I was showing them around the Ford design studios. For whatever reason he and I just hit it off, it turns out he and I had a lot in common about the way we look at design. The cars are kind of like the architecture and the entire cultural layout of Zootopia. J Mays: No, I worked on the robot for that film! The red superhero part. I came in quite late on that film, and he asked me to do some draw-overs on the robot part. And some of that made it into the film. And then he said I’d like to get you more involved from the start on the next film, which is Zootopia. and really come in and share the storyline, and give you the brief and the assignment. I got the storyline, and they sent me, hilariously, a police line-up of all the animals that were going to be in the film. Of course Zootopia is a world where all the animals walk upright, like you and me, and in the police lineup they had measurements of every animal. The smallest creature was a two-inch tall field mouse, and the tallest one was a giraffe. So, there were many animals in between. Me: So that makes the H-point very difficult to find, I imagine. 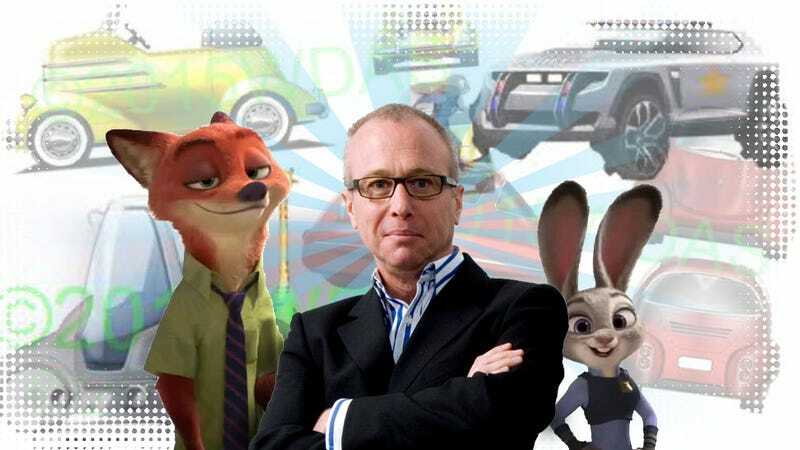 J Mays: Yeah, well, the design essentially becomes one of scale, it becomes cultural backdrop, since each of these animals lives in a different part of Zootopia. Then, there’s purpose: what are the animals using these vehicles for? So there really was a greatly fun project. I mean, whether you’re designing an automobile for a giraffe or a human, you’re still looking for the story and the magic in that design. Me: Absolutely. I’ve given it some thought with that squid car thing I showed you. With the squid car, I was thinking about how these animals communicate how do they sense their environment—how much flexibility did you have? I know for what you were doing all the cars have to work in a common environment, did you have to think through how a mouse’s car is going to effectively communicate a turn to a giraffe’s car, or abut visibility, or anything like that? J Mays: A lot of those things were issues. I’ll give you two examples. One of the conversations was that the small car would have to be able to drive under the large four-wheel drive cars which sit up high on the road. And you have these sort of brainstorming conversation about how this was all going to work in order for these cars to feel at home with each other on the road. The other end of the spectrum was the car I did for the giraffe, which clearly has a very long neck but a very low center of gravity. I thought that we’ve got to get this giraffe around corners somehow, and although you don’t see any of my drawings, when the giraffe car goes around the corners, the actual top of the vehicle is articulated, and it leans into the corner. Me: Ah. That’s a good solution. J Mays: That’s just couple of examples of the thinking that I put into it, which is, frankly, not that different from what you’d put into a real automobile. Me: Conceptually, did you have styling and thematic differences for, say, predator animals and prey animals? Would you make a predator’s car inherently more aggressive than a prey animal’s car? J Mays: Well, uh—similar train of thought, I’ll give you two examples. One of them is there’s a grumpy old moose in the film, and there were two challenges with that. How do you do a old moose car that will have headroom for his antlers? Me: Sure, antler-access is a big deal for the moose. J Mays: And the answer is you don’t—you make it a convertible. And the other part was what kind of car would an old moose drive? I ended up putting him in an old—I call it a Cord/Cadillac/bumper car that has really funny truncated proportions, and if you squint really, really a lot you might think Gordon Buehrig had something to do with the front end of that car. But that’s the line that we did the moose car, but on the other hand, one of the key characters in the film is Judy Hopps, who’s just a little bunny rabbit, who starts her life on the police force as a meter-maid, but her aspirations are to become a full fledged police officer. There’s a symmetry in automobiles that’s very much in line with the symmetry of facial features. And she runs—and here’s where Disney does magic—she runs the gamut from driving this tiny little um meter-maid’s golf cart to the SUV I designed for her, which is just this big, brutal, get out of my way kind of thing. Of course, the juxtaposition is what’s hilarious. And that’s great fun to do that kind of stuff. Me: Are there interior shots where you have to justify how the controls and pedals move to accommodate such a tiny animal, especially if this is a police car that other species may be using. Did you have to think through any details like that? J Mays: No, not really. If you see the film—I don’t know if you’ve seen the trailer or not—the trailer gives you an indication. The cars are kind of like the architecture and the entire cultural layout of Zootopia, and becomes a backdrop—a very important backdrop, but a backdrop nonetheless—for the actual storyline. And the storyline is focused on the main characters, obviously. Me: Sure, and that makes total sense. Now, in thinking about cars and animal designs – I don’t know if you were thinking about designing the cars to have any particular visual traits an animal would have, which leads me to a broader question: it’s a theory of mine that the reason that cars tend to be so symmetrical, bi-laterally, where you even have like a “face” with the headlights and grille forming the eyes and mouth, is that maybe humans in the deep recesses of our primitive minds may read cars as animals, in the same way we may read buildings as landscape. So, what do you think of this theory and what it explains by why we’re so symmetrical with our cars, and second, how do you feel about animal derived visual elements in cars? J Mays: That was very prominent,. Let’s start with the animal-derived styling in cars. It’s prominent in loads of facial front-ends that you see on automobiles and i’m sitting here watching cars drive by, and there’s a 2010 Mustang going by, and there’s a lot of shark and a lot of aggression in the front of that. You can make the same analogy for cars that have a lioness-like face with nostrils and eyeballs on them. They’re all anthropomorphic. So, the first part of your question, totally agree, I don’t think cars—or any moving object, are made to be asymmetrical, because it goes against the grain of what humans are comfortable with. There’s a symmetry in automobiles that’s very much in line with the symmetry of facial features. If facial features are drastically asymmetrical, in humans, I think that makes us uncomfortable, and the same goes for how we perceive automobiles. I think the SUV is the one that everybody will see and think, yeah, that’s cool looking! I fully expect it to be copied by someone in the next three months. Of course, then it gets into, if you, like, see a car with very browed headlamps, like a BMW or a Mustang, you think that looks very mean and aggressive. You see a car with great big round headlamps, like the new beetle, you think, oh gosh, isn’t that a cute baby of a car. All of these are visual cues that are conveying some of the essence of the automobile. Me: I think that’s absolutely true, In periods of time, especially in the US, before we had complex headlight shapes and just had round lights, you would sometimes have aggressive cars with faces that weren’t necessarily aggressive. A Shelby or AC cobra, for example, has that very fish-like front end, which is actually a friendly face — if it were to be done today, i suspect they would have done it much more aggressively. J Mays: Yeah, I agree. That’s one of those examples where technical limitations kept everyone on a pretty tight reign, whereas today you can almost do any kind of headlight shapes you want. Me: Did you keep vehicle communication and signaling the same as humans use? I ask because recently I was thinking how differently car-to-car communication might be if humans had tails. I speculated that maybe we’d have a car-based mechanical tail instead of indicator lights. Did you incorporate anything like that from the animal world? J Mays: (laughing) no, not really, but you have a rich imagination, Jason! J Mays: The closest I came, I suppose, was I was designing a series of cars for pigs. in the film. I thought it would be really fun to do a 3-wheel homage to the Morgan with a rounded back end, and on the back I had a little swirly pig tail. But it’s more like an antenna than a turn signal. Me: Are there any particular cars in the movie that we should be looking out for? Are there any that are your favorites? J Mays: I think the SUV is the one that everybody will see and think, yeah, that’s cool looking! I fully expect it to be copied by someone in the next three months. Me: So, we’re going to be looking at next year’s SsangYong, is what I’m hearing? That shows a couple of things—it shows the characters in the animation are the key to telling the story, also it goes to the absolute determination on the part of disney to not let one single detail fall through the cracks. again, i cannot compliment them enough it’s a joy to see how enthusiastic they are to get these things right. Me: That’s very evident in Disney things I’ve seen. How do you feel about animal names for cars? I’ve always liked them, and while they’re falling out of favor, I think they have a place. Do you have any favorites? any animal underrepresented when it comes to naming cars? J Mays: It’s really funny, because you can kind of go down the a list names of cars, and when you say Jaguar, everyone knows what you’re talking about, you say Mustang, clearly everybody gets the connection. You get down to some point where you’re saying things like “Marlin” — there must not have been much left to pick from at that point. Me: “Sturgeon” I guess didn’t focus group well. Or Scrod. J Mays: It’s funny, but a load of muscle cars had names like that. GM did a great job of getting away from that, just picking up numerical or alphanumeric names—442 or GTO or whatever. If it’s a great animal, it’s fantastic. If it’s a cheetah or a Jaguar or a Mustang—on the other hand, you probably should stay away from some of them. The animal names that make it on to automobiles that have really resonated have been both aspirational animals you look at and think what gorgeous animal that is—and they happened to be attached to a really great looking car as well. so, it kind of works that way. Me: Is there an animal that deserves automotive representation on a car that hasn’t gotten it so far? J Mays: I think your squid is a perfect example. I think you should be lobbying Disney and trying to work that into one of their films. Me: Are there motorcycles, and for animals wildly divergent in body plan, like a snake, did you have to design for those? J Mays: I didn’t have to work on anything for animals that were legless in any way, so no snakes and no fish. One thing I did have to do was adjust the scale. I did one for a hippopotamus. It takes quite a big, heavy, load-bearing SUV to be strong enough to hold a hippo. Me: That’s a challenge right there. If we ever made contact with aliens, and they were very interested in our skills with land transportation, would you be up to design a car for beings with a totally different body plan, and, likely, a whole different understanding of aesthetics? J Mays: I have no idea. Wow, what an off the wall question you just gave me! Me: Well, you designed for animals! I figured this would be the next step! J Mays: My mind was racing somewhere between Close Encounters of the Third Kind and The Day The Earth Stood Still. I’m trying to imagine what they would look like. Of course, I’m a child of the 60s, so I was thinking robots or flying saucers, some sort of morphing ectoplasm? I have no idea.